Fans of the late great Rhinestone Cowboy will delight in this extensive DVD/CD anthology of live recordings capturing Glen Campbell at the height of his popularity! 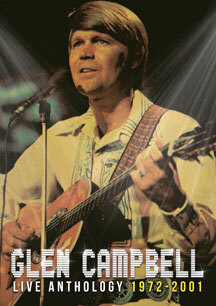 This 70 minute Concert video anthology features performances of every major Campbell classic including "Rhinestone Cowboy," "Wichita Lineman," "Galveston," "Gentle On My Mind," "By The Time I Get To Phoenix" and lots more! 1. Rhinestone Cowboy 2. Galveston 3. By the Time I Get to Phoenix 4. Try a Little Kindness 5. Wichita Lineman 6. Gone, Gone, Gone 7. Walkin in the Sun 8. On a Good Night 9. True Grit 10. The Hand That Rocks the Cradle & MORE! Fans of the late great Rhinestone Cowboy will delight in this extensive DVD/CD anthology of live recordings capturing Glen Campbell at the height of his popularity! • Features performances of every major Campbell classic including “Rhinestone Cowboy'! Special guest appearances by Wayne Newton, Anne Murray, Seals & Croft, Helen Reddy, and more! Features performances of every major Campbell classic including 'Rhinestone Cowboy,' 'Wichita Lineman,' 'Galveston,' 'Gentle On My Mind,' 'By The Time I Get To Phoenix' and lots more!